“The message sent obviously is that you can’t do that,” Logano said during an interview at Texas Motor Speedway Friday morning. 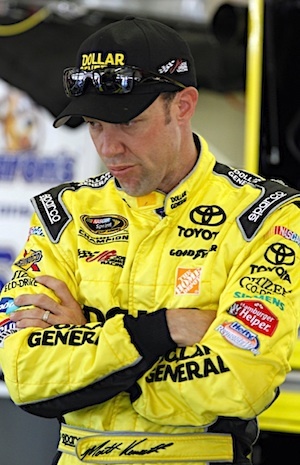 NASCAR has suspended Kenseth from competing in Sunday’s AAA Texas 500 and next weekend’s Chase for the Sprint Cup Championship event at Phoenix International Raceway after the 2003 series champion intentionally drove both cars into the Turn 1 wall at Martinsville. 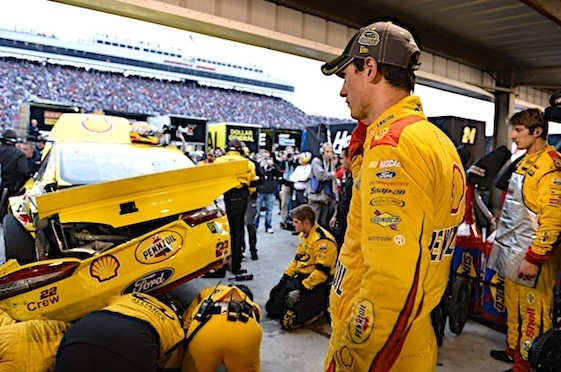 Friday morning, Logano issued a message of his own – this is a test of character that he and his No. 22 Penske Racing team intend to win. “To be honest, I’m not convinced it’s (the crash) a bad thing,” Logano said, quite calmly and eloquently. “Our team is more fired-up than ever. I’m more focused than ever. I’m pumped-up about being here at the track today. Logano was in the lead and apparently en route to a fourth-consecutive victory when Kenseth – running nine laps down – punted him into the wall. Both Kenseth’s No. 20 Toyota Camry and Logano’s No. 22 Ford Fusion were extensively damaged. currently sits in the last position on the eight-driver Chase Grid, 28 points outside of the cutoff to make the “Final Four” field at the 1.5-mile Homestead-Miami Speedway. Logano now likely will need to win one of the remaining two Eliminator Round races, at either TMS on Sunday (2 p.m. EST on NBC-TV) or PIR’s 1-mile oval on Nov. 15. Logano was fifth at 196.000 mph after recording 20 laps around TMS’ high-banked, 1.5-mile quadoval during opening Cup practice. 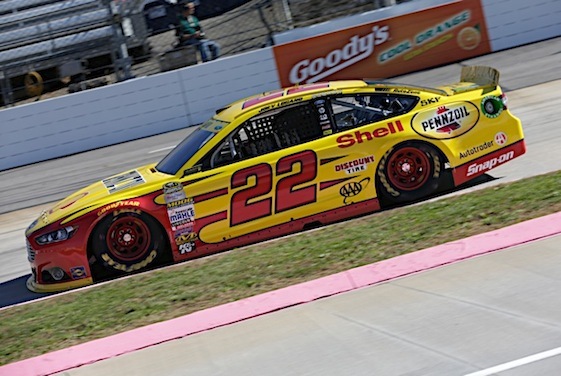 Brad Keselowski, Logano’s Penske teammate, topped the chart at 197.059 mph after just seven laps in his No. 2 Wurth Ford. Cup qualifying is set for 6:45 p.m. (EST). Kenseth, of Joe Gibbs Racing, lost a pair of appeals on Thursday, although his original six-month probation was reduced to the end of the calendar year. Kenseth has been replaced in the No. 20 DeWalt Toyota here by Erik Jones, current point-leader of the NASCAR Camping World Truck Series for Kyle Busch Motorsports. Jones, 19, will be making his third Cup start this season on Sunday. Kenseth reportedly has said he has “no regrets” over his actions in Martinsville, widely interpreted as retaliation for the bump-and-spin that Logano delivered on the No. 20 Camry as it led with five laps to go at the 1.5-mile Kansas Speedway on Oct. 18. “Well, I can’t speak for Matt,” Logano said. “It’s in the past at this point. It’s in the rearview mirror. The only way we will get in the Chase is if we keep looking out the windshield. “But to answer your question about Kansas, to me, in my opinion – re-watching the race and what happened – I will stay true to what I’ve been saying. I had a great race going there for the lead and there were some blocks thrown and the third time I kept my nose in there and the way I view it personally is that it was hard racing. he end of the race here he was on the inside of me and I took the risk of blocking. I took that risk and I knew the consequences. He moved me out of the way. I said that’s what I had coming to me. He kept his nose in there. I knew the chances I was taking. There was nothing I said to him. I didn’t expect a phone call from that. I didn’t expect anything. I felt like in that case I was in the wrong. I put myself in that situation and I got moved up out of the groove. I wouldn’t say Harvick and I are the best of friends but I didn’t have a problem with what he did. That’s the way I feel like racing is. When you make moves like that, you know the risk you take. Logano was asked if he felt anything he said or did post-Martinsville could be interpreted as arrogant. “I don’t think I’m an arrogant person, to be honest. I’m being myself,” Logano said. “This is one of those situations that you have to be true to your character and true to who you are as a person and retain that faith. If I was arrogant in any way I’m sorry but I don’t feel like I was at all. I feel like I was being myself and being a hard racer, which I have always been and always will be. I don’t believe that’s arrogant in any way. Logano said he has benefitted greatly from the advice of Penske’s hierarchy, particularly team-owner Roger Penske and Walt Czarnecki, executive vice president of Penske Corporation. “I’m 25-years-old and still have a lot to learn, right?” Logano said. “When you have Roger Penske and Walt Czarnecki as leaders of your race team you listen to them. They have been through every situation that motorsports can present to them. Taking their advice is very important in a situation like this. Conversely, Logano said he was taken aback by the fans who stood and cheered Kenseth for putting him into the fence. “Was I surprised to see the fans reactions? Yes I was. I was disgusted by it,” Logano said. “That’s not what any racer would expect out of it. But I’m going to look at the silver lining on this one. 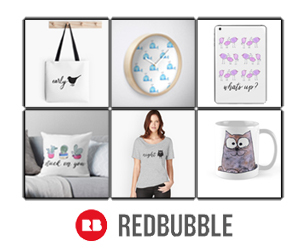 There were more No. 22 t-shirts and Joey Logano t-shirts and hats…when I was walking out of Martinsville I noticed that. There were more fans rooting for me now than ever. That’s pretty cool. Kenseth will be eligible to return for the Ford Championship Weekend at Homestead-Miami Speedway on Nov. 22, when Logano may or may not be in the “Final Four” eligible to win the 2015 championship. Logano said whatever the circumstances, he will not race Kenseth any differently. “No, we move forward,” Logano said. “Our goal when we get to the racetrack is to win the race. It’s not revenge. It’s not taking someone out. There is a trophy. When I walked in here (infield media center) there is a pretty cool trophy with a cool hat on the top and I want that. When we get to Homestead there will be another cool trophy. I don’t know what it looks like but I bet it’s pretty cool. We are going to want that. That’s the No. 1 goal when this team gets to the racetrack.